It may not be entirely clear in the picture, but those pants are touching the floor. They go all the way from the floor to my armpits. I could not stop giggling. Those pants are almost 5 feet tall all by their lonesome. Which is apparently all it takes to crack me up. 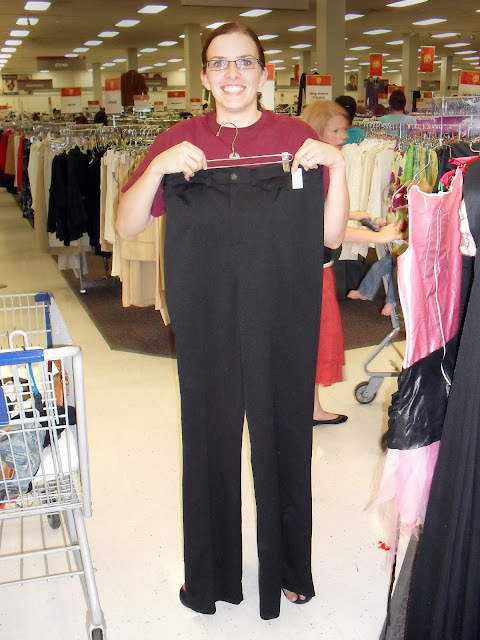 5 FOOT TALL PANTS!! Yep. You may not know this about me, but I was a cheerleader for about 2 weeks once, and let me tell you, these pom poms have hit the nail on the head. "Drink for them, colourfulfor them" are the basic tenets they teach at cheer camp. And clearly THESE pom poms are of the highest quality. That says they are perfect, and I don't think they would lie. Skillful manufacture indeed. These beauties would turn anyone into a first rate Encourage Leader. "GO! CLAP!!" Repeat that mantra hourly and you will be peppier, and encouragier in No Time! And Hygiene!